I have been getting so many awards of late, I just am not able to reciprocate the way I would LOVE to. So, instead, I will list the awards here and who gave them to me. That way, anyone can view this page and know what wonderful blogger friends I have. I am truly honored that some glorious people truly think Petals Unfolding is deserving of awards. I am moved to tears. And I am so grateful. So very grateful. Without any of you, this Dream of mine would not be happening. Bless ALL of you for BEing here at Petals Unfolding. This is my Dream, this is my Creation, and this is my Way of touching Hearts with Love, Compassion, Humor, Peace, Truth, and Honor. I Love you so much. You have enriched my Life beyond what I can put into words. You are SO amazing! Just know that my reward is through you being here, enjoying my work, and being a part of my life. That is reward enough for me. Before you came into my life, I experienced such loneliness of spirit, but now, because of you, I am rich beyond measure. Thank you so much! I received two other awards from Tonya. (Please see above at Most Influential Blogger) for Tonya’s stats. 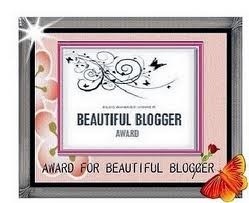 The two awards are: Beautiful Blogger Award and Very Inspiring Blogger Award. From Emma. Thank you, my friend. From my dear friend, Darrel, who designed this gorgeous LOGO. Thank you! Given to me by Kemdirim Okezie on 11-25-15. Nominated by Daniela Apostol. Thank you!! Nominated by Brenda. Thank you!! Nominated by Sparklingpoems. Thank you!!! Philip, truth be told, you just caught me shedding a tear or two. I’ve had changes this year and in those changes, “new” has been found. But not without a cost. Thank you for your encouragement. I needed it today. I always get sad around this time of year, (truth again) because no longer are family and friends around. L O N G story. Too long to be told. I try to make others’ hearts happy instead. Which makes me happy. I hope you get this reply. I hope you checked the reply button. Love and JOY to you, Philip! May you and your family have a JOYous Holiday! I did get the reply Amy! So glad that a simple act of encouragement has been beneficial at ‘just the right moment.’ Isn’t it amazing how that kind of thing happens. Bless you, Philip! Petals Unfolding is keeping me so busy, I no longer am able to be at the Pond. I miss the friendship and the bonds that I had. That is the double edged sword I was speaking of. At times we must let go of things in order to make room for the new. I am glad you are able to fit the Pond in, in your life. Yes, Philip, seems my “light” is touching the world, as I had Intended. 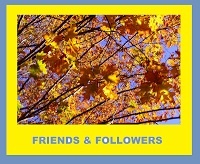 My followers are growing steadily and spirit keeps whispering words to me to pass along. Again Bless you, Philip, for I find myself in the encouraging seat. To be honest, my head is swimming with all these awards, and in fact, I received another one today. That is why I came back on here to write a beautiful post to thank the person who gave it to me. I am humbled beyond words, so grateful that GOD is using me in ways I never thought of. This is why I follow my Heart. My Heart knows more then I do. Thank you for “seeing” what I am doing here. I wish you all the best in what you do as well. Perhaps one day we shall meet. The heart indeed works in mysterious ways at times doesn’t it! Though always wise to follow it. I know you value the Pond so much and have put so much into it! It seems like it has helped you in ‘discovering’ this current calling. I know it would be easy in one way for me to spend more time there but then I would not be following my calling with Spheres Of Light so striking a balance has been important for me too in the last few months. I feel and observe this has happened to quite a few. So, for me, you are absolutely following what you feel called to be/do/share and that is more than enough. It will bring you much joy I feel in magical ways… as it is already doing! Philip, you truly are a beautiful man. In all ways. Your words are balm to my Heart. And I really do thank you. As I’m an author and writer too, I think I’m going to do the same with Blog Awards as you have. My time is precious these days as I finish my next two books. It’s a lovely honor, but like you, I can not keep up with giving my Readers & Sweet friends the justice they deserve to honor and share the awards with others, so great idea! Thanks for the hugs! Have a great night!! 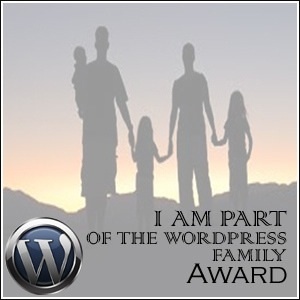 Dear Amy, you are on my thought as the person to get WordPress family award that I just received it recently. 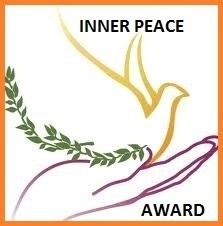 Just to let you know that you are in my thought to receive the award (which is you already had ;)). I respect your decision to have a free award blog now.. Hugs and have a great day..
You have a very giving person…a gift to all of us! thank you for being in my writing life! I took the time to visit your blog today, and I was very glad I did. Keep on blogging! Thank you, dear, for following me! I took a look at your blog yesterday and while reading your about page I found myself with my mouth wide open. You are an impressive person to me and I am happy I found you hear in order to read your stories and messages. I also took a look at your award page. Like you I feel honored for getting awards but from the first nomination on I didn’t feel comfortable at the same time. I too feel gifted to write about the wonderful things I experienced and get the chance to share it with others in order to maybe bring something in motion. 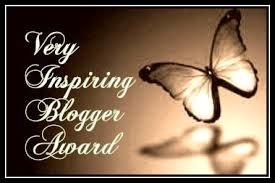 Also to me it is the greatest reward to have people like you reading my posts, liking and even commenting them I hope you don’t mind it, but I would love to take over your idea of posting the awards I got by now and make my blog award free. I wish you a merry Christmas and I am looking forward to starting into the new year with you as my follower and also following you! Dearest Erika, I am deeply humbled by your words when you spoke of my About page. Yes I have a very full Life, and how I even blog, or much less participate in the very complex and involved art called digital photography, is beyond me. I’ve developed excellent time management skills. (smile) I LOVE to give and to share, so what you see on Petals is a representation of my Life, what I have learned, (am learning), my dry sense of humor, the wisdom gained again from my Life (one of my WP friends said once, “Amy, you are like a little Buddha” … smile), and the Love and Beauty expressed here through both word and photo. I am honored you are now following me, and my HOPE is that Petals enriches your Life as you walk upon your Life Journey. Regarding awards: I am truly honored when I do receive them, yet I no longer fulfill the many requirements. They are too time consuming, and I just do not have more time to give. What you don’t see is me working behind the scenes, communicating to a LOT of people, lifting them up, encouraging them, developing real friendships, a continual flow of conversation that sees me at my keyboard many hours in one day. So yes, awards are just not feasible for me, and so I have developed a system to acknowledge the person who gave me an award through my award page. Happy New Year, dear Amy. I wish you ever more happy whiles in the 2015. I can’t find your email, so I come here. Don’t be sad, this is a time to open yourself to love…but you know that. I wish you even…ever doesn’t meke sense. Dear Amy.. 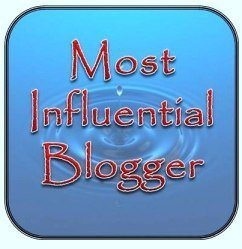 I know you are now an Award Free Blog.. As from today so am I.. 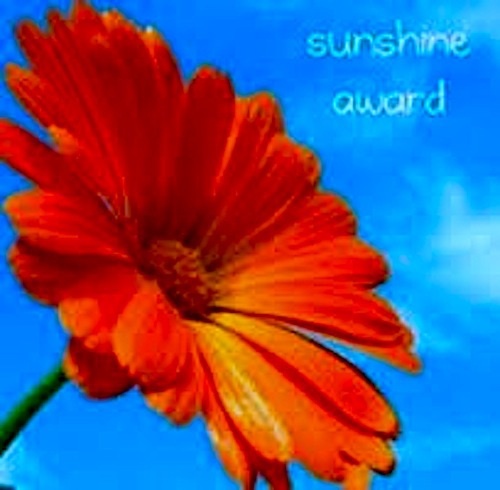 But I created this award.. and would be so honoured if you were to accept it.. and perhaps pass along to another deserving soul..
Prizes really get to me cuz I have to know what it is ahead of time. I celebrate Christmas in July, just to get there early! Is there a way I can save this for persperity? This is just the most beautiful thing I’ve ever read… (Sniff…) Just a sec. I have to blow my nose… (SNARK!!!) I don’t know what to say! I’m really touched in the head! 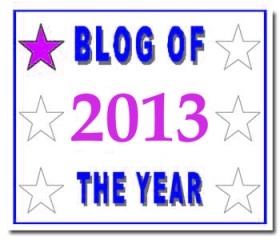 Well-deserved awards, your blog is amazing! Congratulations on getting so many awards. Your blog is truly deserving of all of them.